Retired life has been amazing! I won't get into all the details of how incredible a life on lay-away has paid off, but I did want to jot down a note about a battle I was forced into recently because it has a lot of crossover with the old life. Sadly so. In short, a literal fascist by the name of Clarence Moriwaki who represents the Bainbridge Island Japanese American Exclusion Memorial (hypocritically) presented himself as a domestic threat to the Constitution in a very serious way. Moriwaki is personal friends with our mutual Bainbridge Island neighbor, Jay Inslee, having worked for him when he was a Congressman. You may have heard of Jay Inslee, he's running for president. Anyway, in a nutshell, Moriwaki didn't like my public criticism of him (that was a first) and he filed a Hurt Feelings Report in the form of getting a corrupt judge to disarm me for several months, exclude me from parts of my property, and censor me. 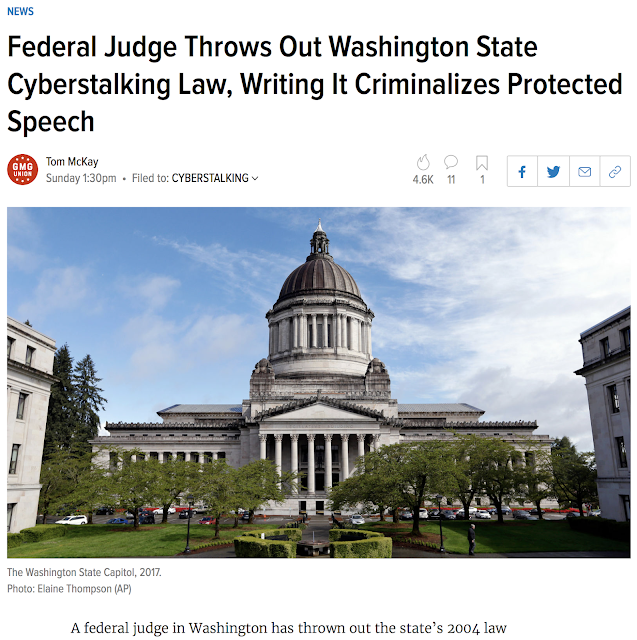 My clearly protected non-threatening, non-defamatory and non-profane public criticism was called "cyberstalking" and in Washington State posting online anonymous or repeatedly something that might embarrass somebody else was illegal and could get you put in jail for a year. Yeah, don't vote for any politician coming from Washington State, please. So I beat the guy in State court on appeal and then sued our State in federal court and with the help of the ACLU of Washington, the Electronic Frontier Foundation, and UCLA law professor, Eugene Volokh, got the cyberstalking law struck down as violating our Constitution. You can read all about the whole bloody mess here at MoriwakiVRynearson.com. If you don't think fascism is a real issue you haven't been reading my blog and you haven't been paying attention. It's real and I had no idea just how real when I was in the military because there those who claimed to be liberals were actually liberals. On the outside, those who claim to be liberals are often fascists. I had no idea how bad it was. It ain't pretty. What might be most interesting to any readers left of this blog, is how in court documents the "evidence" Mr. Moriwaki used against me was pretty much every negative post from the Digital Clown Show at Baseops.net and any cross words from our good friend Tony Carr and JQP. So I thought I'd drop a note in case anybody was interested in how fascists in the military responding to my criticism became used as fodder for a civilian fascist, Clarence Moriwaki, to literally violate my constitutional rights until I got that sorted out. That stuff was just atmospheric though as even my detractors didn't go to the staggering defamatory lengths of Mr. Moriwaki. I digress. Some of our favorite Snowflakes even showed up to cheer on Clarence Moriwaki. Dan Tarleton aka Butters of Baseops (who now flies for Alaska Airlines) showed up to like Mr. Moriwaki's Facebook posts and even donated money to Moriwaki's losing attempt to violate our Constitution on a GoFundMe campaign. And you thought I was kidding when I called people fascists even though they wore a flight suit? Dan Tarleton is a retired military officer who funded a blatant assault on the Constitution of the United States he was sworn to support and defend. Tarleton is just one of many who should have never been commissioned in the military due to a serious lack of character. Oh, Brandon Bryant also popped by and made connection with the fascist forces I was fighting and expressed joy at the prospect that I'd lose in court. I was pleased to let him down on that score. It's amazing how many people are still smarting from words so true they convict them so deeply. That's a weakness that could be remedied by looking in a mirror but I suppose that's hoping for too much. Anyway, just thought I'd post this update. Back to retired life. Fly safe and remember your oaths. Remember, we're paying you to support and defend our Constitution and we could use the help right about now. If it's not too much to ask. P.S. Check out MoriwakiVRynearson.Com for details. Pretty fascinating and horrifying stuff.